This delicious peanut butter swirl fudge is smooth an chocolaty with a pretty swirled pattern in the center of the fudge that makes it perfect for gift giving or holiday platters. This easy chocolate peanut butter fudge recipe is one that I make all the time for the holidays. For most of the year, I try to stay away from sugar, but when the holidays start to roll around, I get a craving for fudge. 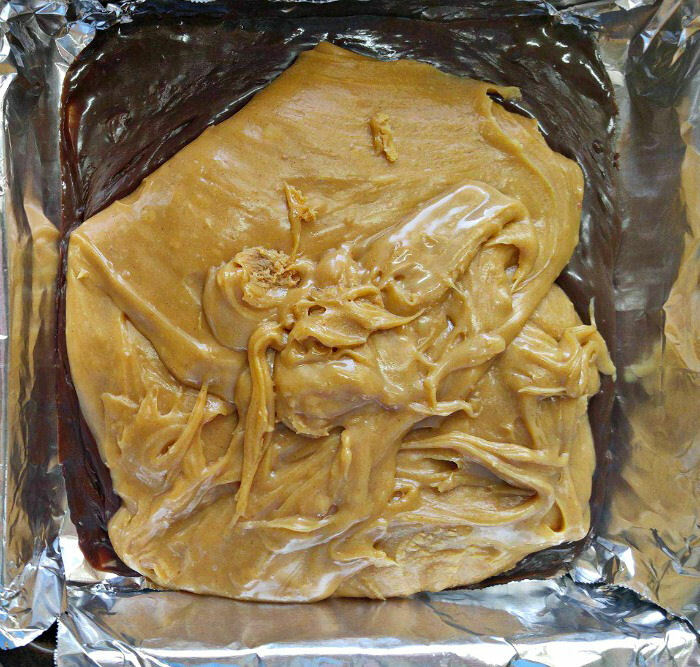 I’ve tried just about every combination of fudge out there at one time or another, but my favorite is always peanut butter fudge of some sort. If you love the combination of chocolate and peanut butter, too, be sure to check out my fudge brownies with peanut butter frosting. They are to die for! This Buckeye fudge is also a personal favorite. 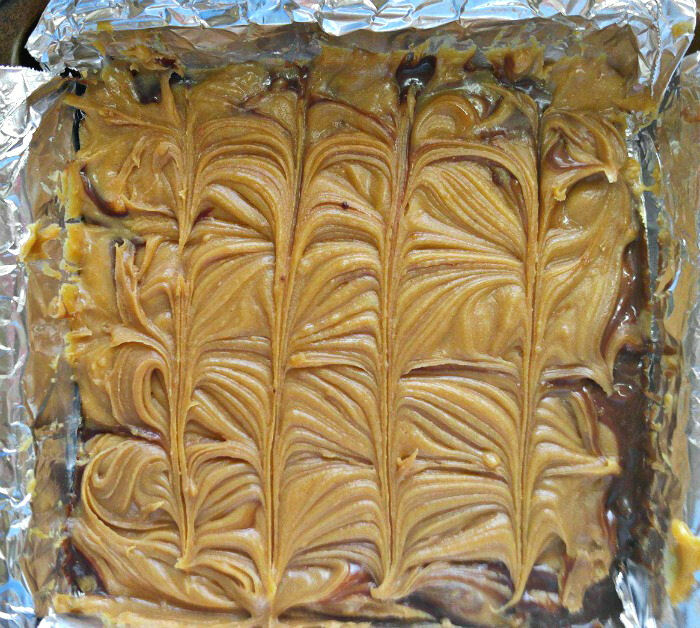 Making this peanut butter swirl fudge. 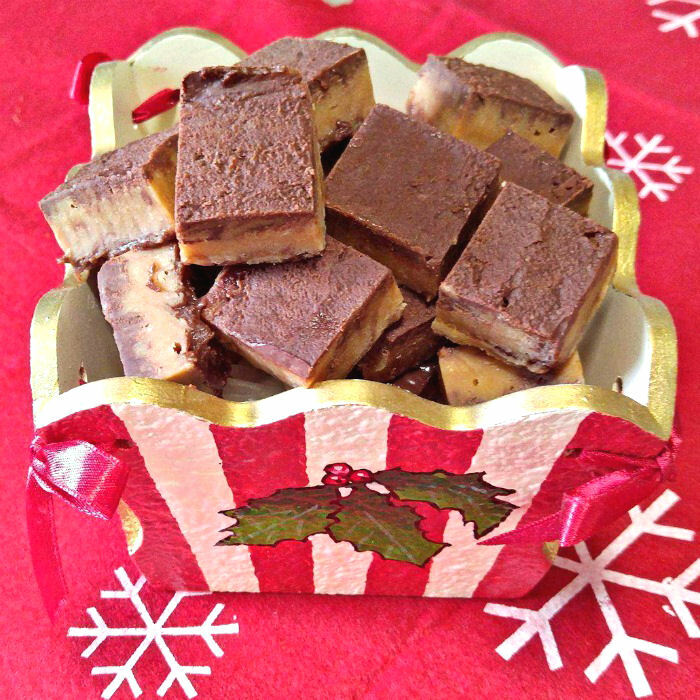 This fudge recipe is perfect for the holidays. The pretty swirled center blends the two flavors together well, and the fudge looks so pretty in a festive holiday gift box. It really shows your friends that the gift is made with love. Start by lining your pan with parchment paper or aluminum foil. I leave extra to overlap the edges, so the paper acts like handles later to remove the fudge. The fudge is ridiculously easy to make. It has just five ingredients I make it on the stove top in two pans melting the chocolate in one pan and peanut butter, mixed with sweetened condensed milk in another at the same time. The peanut butter mixture is combined with sea salt, while the chocolate mixture has the addition of pure vanilla extract. Once both mixtures are melted, remove and stir well. Add the chocolate layer first and smooth it out, then spoon over the peanut butter mixture on top. Use a metal spatula or knife to swirl through the fudge layers to blend the two flavors for one delicious taste. The final step is to add another round of the chocolate layer on the top and smooth it over the swirled peanut butter and chocolate layers. That is all there is to making the fudge! Into the fridge the pan goes for about 3 hours, until it has set. I can’t wait to try a piece! Once the fudge has set well, remove the fudge from the pan, and cut into 24 squares. Tasting the peanut butter swirl fudge. Finally, I get to have a piece! It is so worth the wait! This delicious fudge recipe is creamy, and chocolaty with the richness of dark chocolate. It reminds me of the taste of Reese’s peanut butter cups in fudge form. The only problem with this fudge is the age old question – Can you eat just one piece? This chocolate peanut butter fudge recipe is perfect for gift giving. 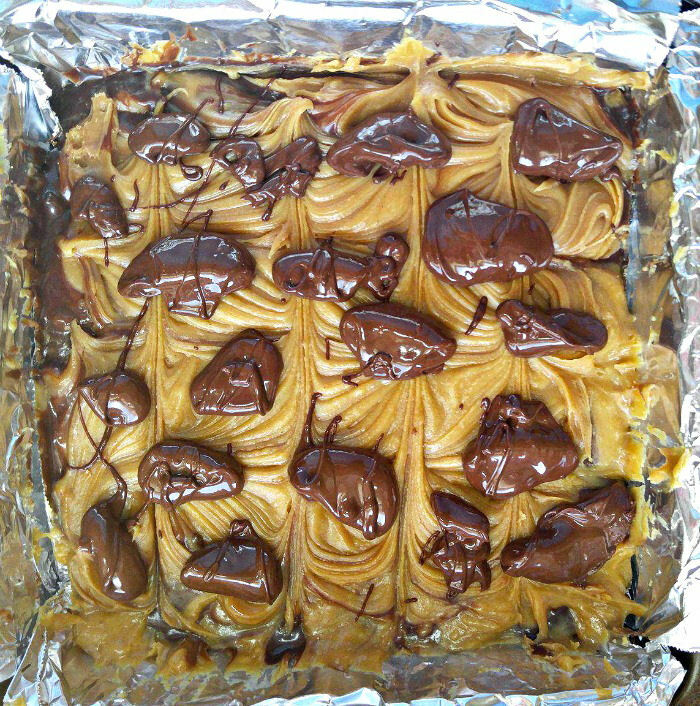 Your friends will love to get a batch of this delicious peanut butter swirl fudge in a pretty holiday gift box. You can also place it in small cellophane bags and tie with a pretty Christmas ribbon. 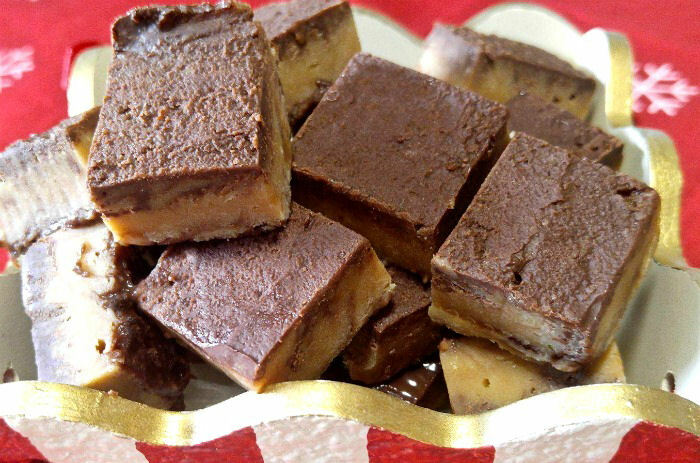 This fudge recipe makes 36 pieces with a calorie count of 134 calories each. 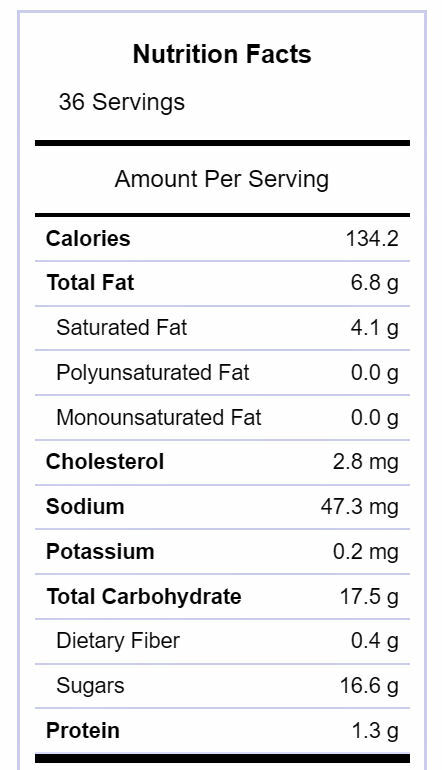 The taste makes every calorie so worth it! .The center of this fudge has a firm, swirled layer of peanut butter and chocolate and the top and bottom layers encase it with rich dark chocolate. It’s a keeper for sure! Do you have a hard time making fudge? Be sure to check out my tips for making perfect fudge. This easy peanut butter swirled fudge is a mixture of peanut butter and chocolate in swirled layers that are both beautiful and delicious. Make a batch for gift giving or holiday party trays." 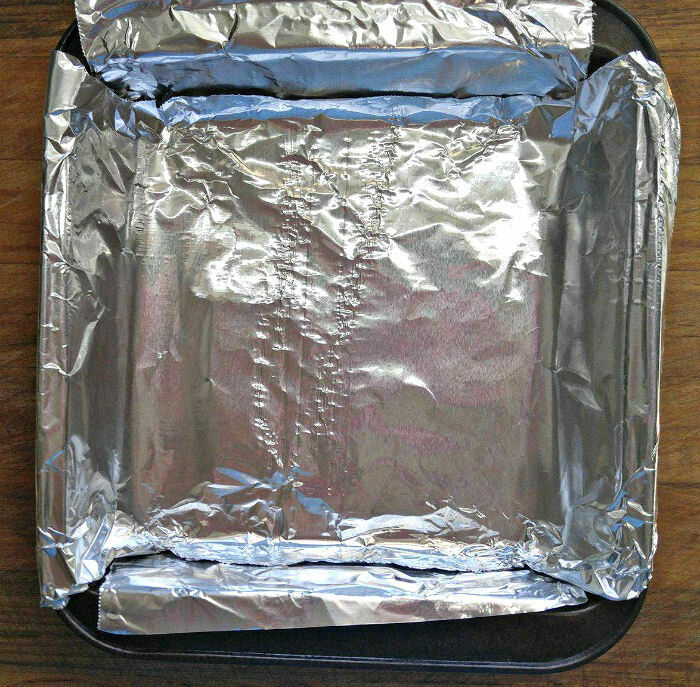 Line an 8 x 8 inch pan with parchment paper or aluminum foil. Allow the paper to overlap the edges to give you handles to remove the fudge when set. Over low heat in a heavy saucepan, melt the peanut butter chips with 1 cup of the sweetened condensed milk and sea salt. In another saucepan, over low heat, melt the dark chocolate chips with the remaining sweetened condensed milk. Remove both pans from the from heat; add vanilla extract to the chocolate mixture. Stir both until smooth. Add the other half of the chocolate on the top and smooth the chocolate with a knife. Place in the fridge and chill 3 hours or until firm. Remove the fudge from the pan and cut into squares. Store in an airtight container in the fridge.